Passengers board a Community Connector bus in downtown Bangor in this file photo. Bangor has received a $1.9 million federal grant to replace at least five buses in the city’s aging fleet. Bangor has received a $1.9 million federal grant to replace at least five buses in the city’s aging fleet, according to U.S. Sen. Susan Collins. The investment from the the Federal Transit Administration’s Buses and Bus Facilities Grants Program will help the Community Connector Public Transit System bus service increase “access to employment, education, and healthcare in both our rural and urban areas,” Collins, a Republican, said. This is the second time the city has won the grant. In 2016, Bangor used a $1.4 million award to buy five replacement buses for its aging 22-vehicle fleet, said Superintendent Laurie Linscott. Those replacements are still being built by the manufacturer, and will hit the streets in staggered phases beginning next October, she said. Using city money, the service added two new buses last October, bringing the total to 23, Linscott said. It only takes 14 buses to run at peak service, but the service keeps a “high ratio” of spares because at any given time, several buses — some of which are nearly 20 years old — are out of commission for repairs, she said. The new grant will fund five more buses, but Linscott said she hopes the extra money this time will cover the cost of six. The new buses will replace those manufactured before 2009, which do not run on clean diesel, she said. 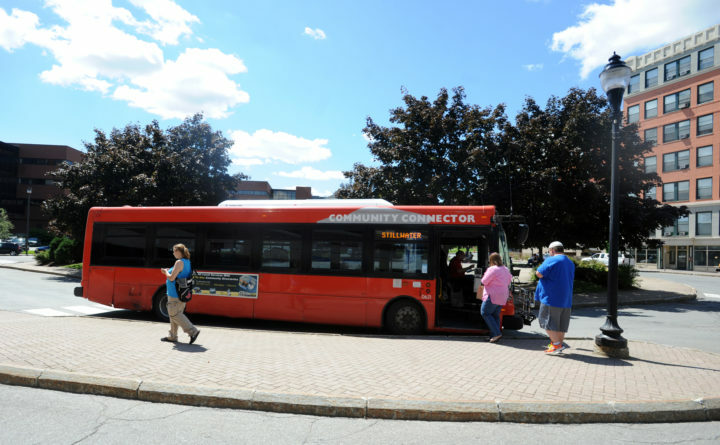 In addition to Bangor, the Community Connector serves the surrounding towns of Brewer, Hampden, Orono, Veazie, and Old Town. The services provides 800,490 rides annually, Linscott said, a number that’s declined from 936,500 since 2013, but more than doubled over the last decade.